Fury Fighting Championship closes out 2018 on December 15 with Fury FC 28. This event will be a black tie event, and will take place at the Humble Civic Center. There will be limited seating at the event, only VIP tables, and no general admission seating. There will be a dinner provided. You can purchase your meal tickets here. The main event will be for the vacant lightweight title. 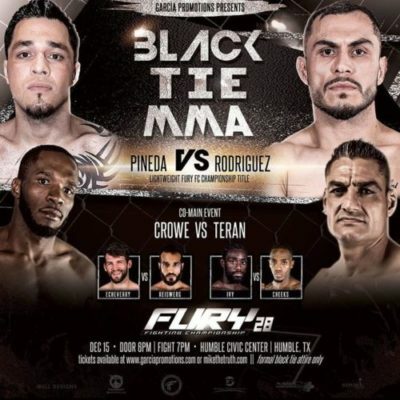 UFC vet and former 2x division LFC champion, Daniel Pineda (23-13), makes his Fury FC debut, and will face undefeated Texas prospect, Eli Rodriguez (6-0). Check out the remainder of the card below. You can support your favorite fighter by purchase your black tie event tickets here at MikeTheTruth.com; fighters receive a percentage of their sales from MikeTheTruth.com.